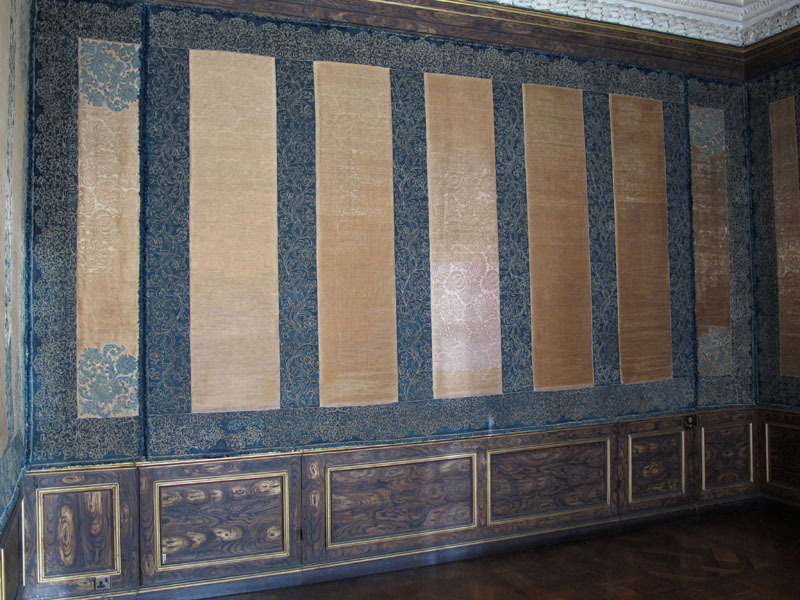 The wallhangings in the Queen’s Antechamber at Ham House, Richmond were a large project for us that was ongoing for several years and included extensive research. 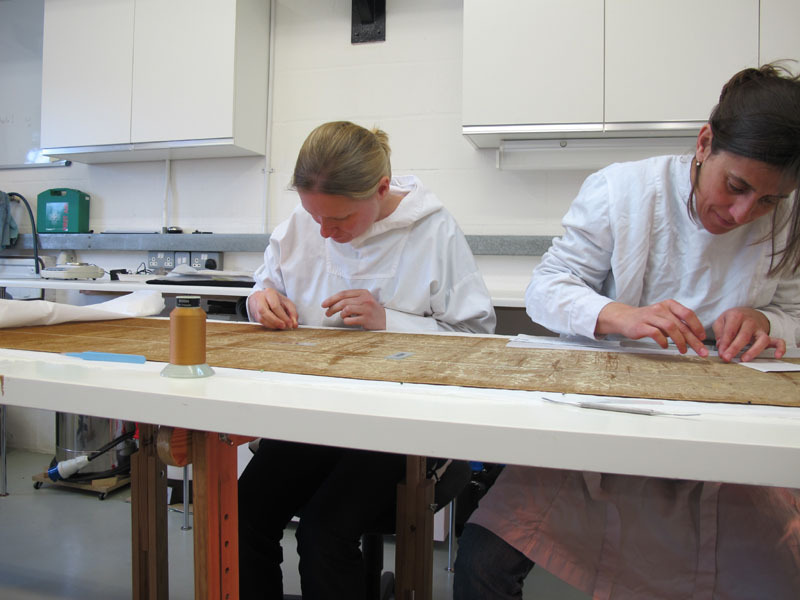 The treatment of the West Wallhanging was completed first in 2010 (See West Wallhanging) before we moved onto the North Wallhanging. The North Wallhanging is the main hanging on the north wall and is one of three hangings on this wall. 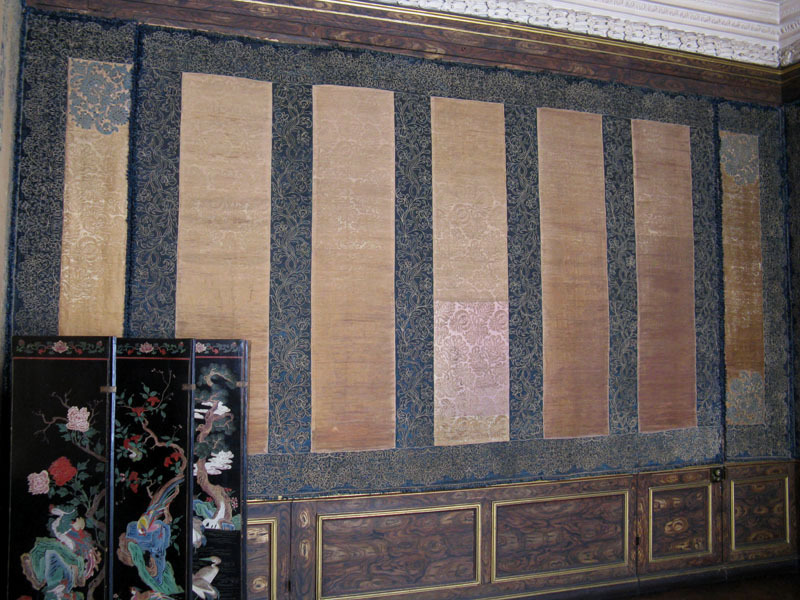 The hanging has central panels of golden-yellow floral damask (originally pink and drab, but now faded) with dark blue velvet borders. 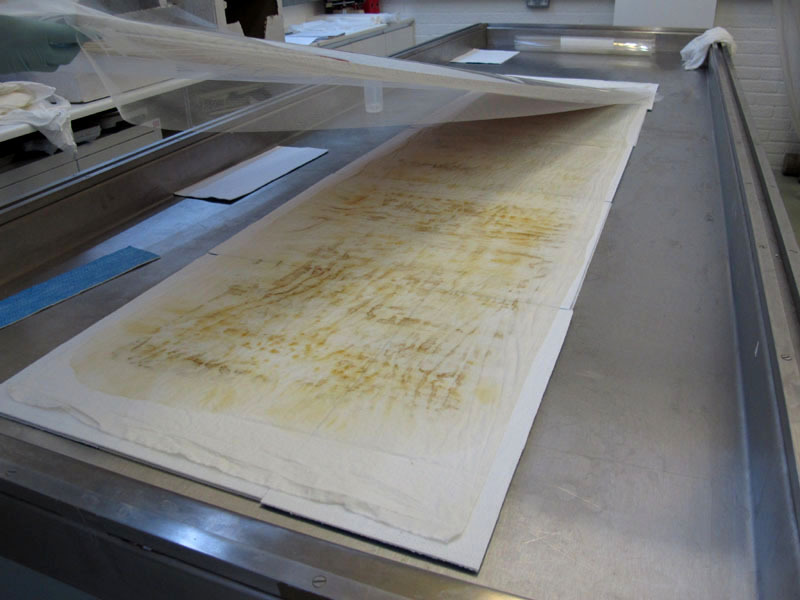 Before work was commenced on the hangings it was thought that they were the original wallhangings from the 17th century, the inventory from 1683 stated that the damask was blue and the current yellow appearance was attributed to fading. 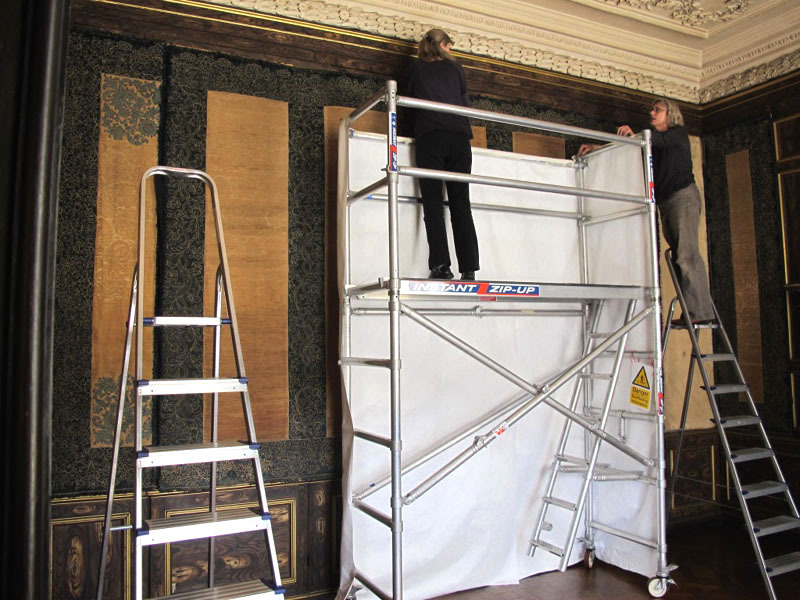 Once treatment of the West Wallhanging began however it became clear that the damask panels had been replaced in the 19th century during restoration of Ham House commissioned by the 9th Earl of Dysart and carried out by G.F. Bodley and T. Garner. Research showed that the replacement damask was a reproduction of the original pattern, however in a different colour, produced by Watts & Co and called ‘Dysart’ which ties it nicely to Ham House. The North Wallhanging was in a very fragile condition with extensive light damage causing fading and disintegration of the fibres. The velvet in particular had lost much of its pile and become very thin and vulnerable. The wallhangings were also very dusty, especially along the top border. 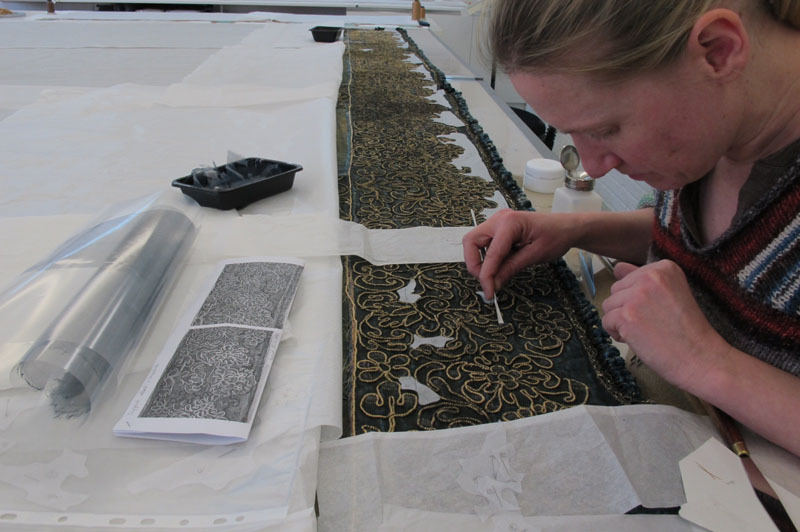 The damask panels had previously been repaired in the 1960s using a shellac adhesive on a silk net support which had darkened with time and become brittle. 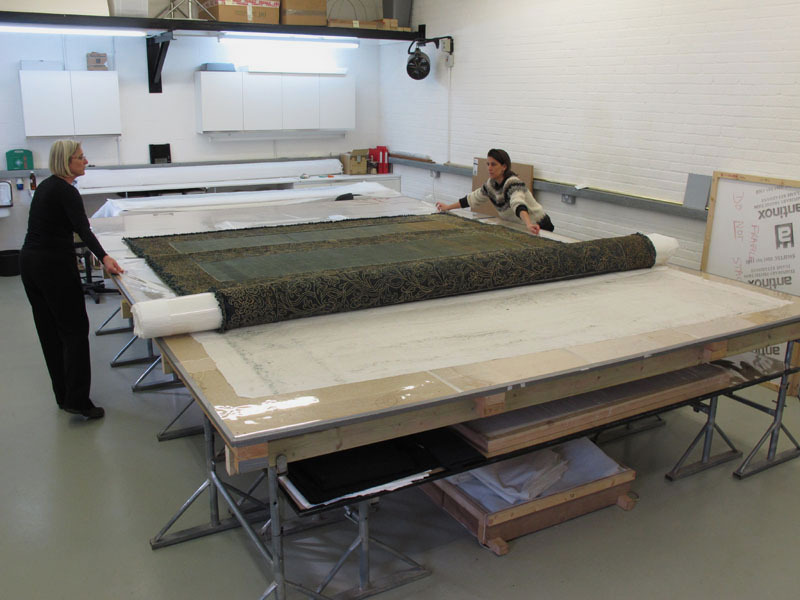 A large amount of conservation work was required to protect the wallhanging. 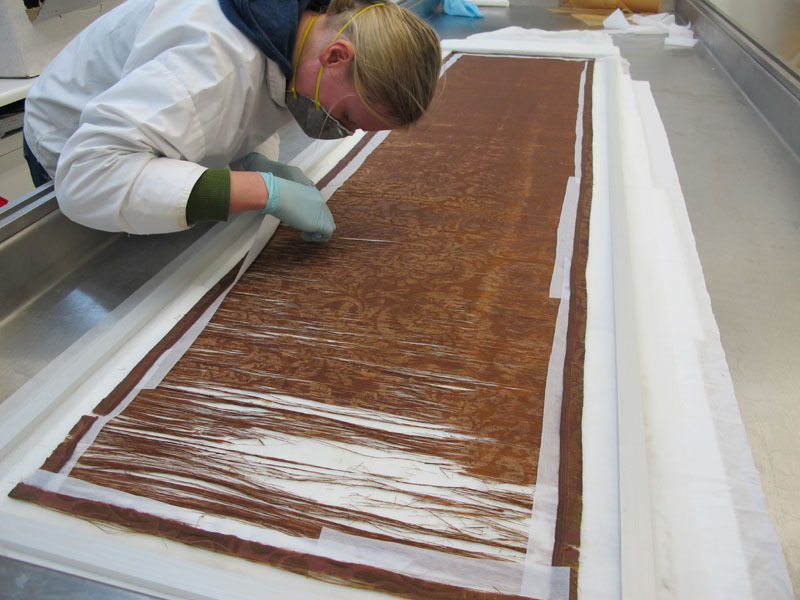 The dust was removed by carefully surface cleaning using a museum vacuum. 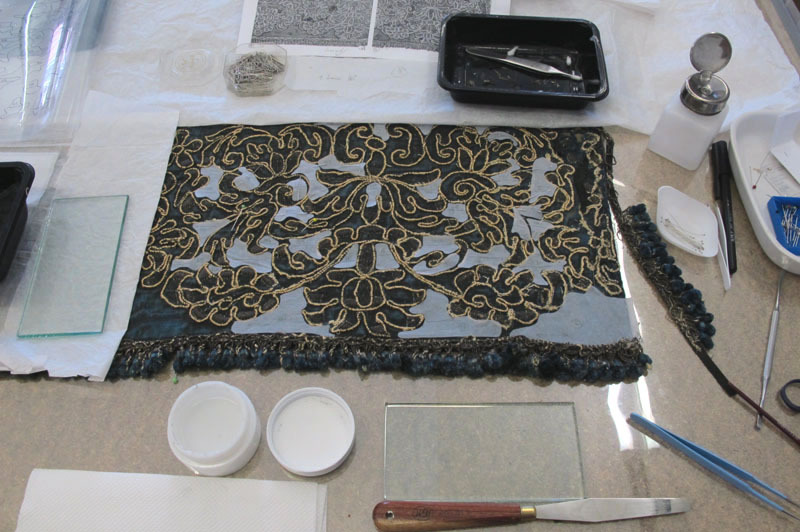 The shellac was removed using a solvent which was flushed through the wallhanging using absorbent pads. 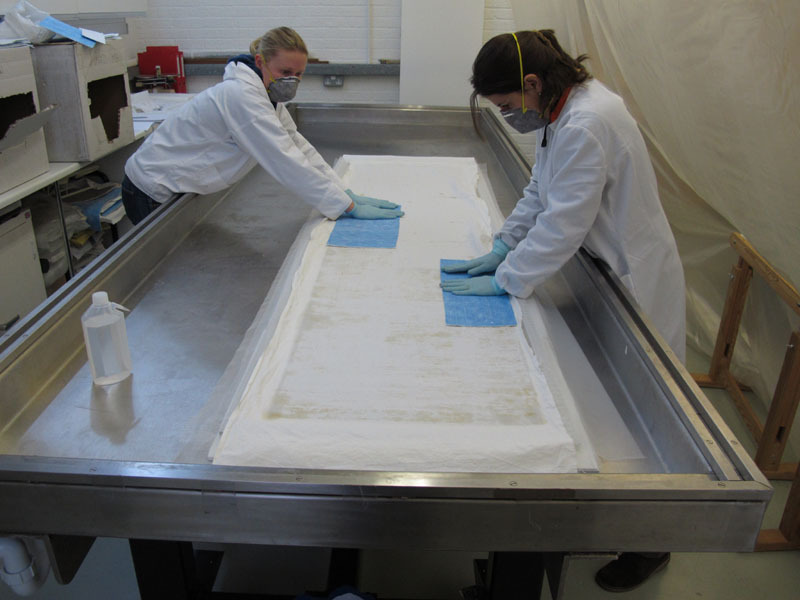 Once the adhesive was removed the silk net could be taken away and the wallhanging was supported with a new silk support using a conservation adhesive as well as laid couched stitching. A conservation net cover dyed to match provides further protection for the hanging. 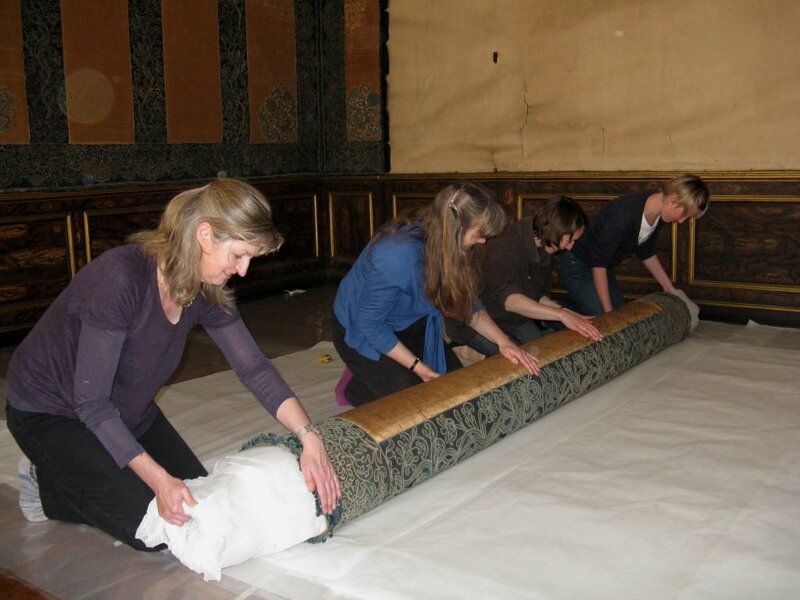 The wallhanging was reinstalled in the Queen’s Antechamber, requiring eight people and a great deal of organisation to return the wallhanging safely to the North Wall. This project was followed by a number of different projects in which coincidentally the same fabric design was seen. This has led to much discussion and research which has been enlightening and very interesting. May presented a paper at the 2014 Icon Textile Group Spring Forum (March 2014), postprints of which will be available soon.